Here at Quail Ridge Country Club, part of what sets us apart is our unparalleled sense of community and engagement with friends and family. Whether it’s gathering for world-class dining and special events at the Clubhouse, a game of golf with friends and neighbors, a round robin match on the Tennis courts, or day of pampering at the Spa & Fitness Center, there’s something for everyone in our beautiful community. With our full calendar of events and activities, we encourage you to join in on all of the fun and camaraderie happening around the Club this year! Enjoy your Championship Lifestyle We’ll see you around the Club! COV EY, noun a party or flock of birds, especially quail. . a group of people or things; a gathering; party The Covey Newsletter is published by the Communications Department: Dominique Jean-Jacques - Communications, Marketing & Membership Coordinator WE WELCOME YOUR FEEDBACK! If you have a story idea, photo, article, or any suggestions, please send to: djeanj@quailridgecc.com Thank you to our members, staff, and friends for their contributions to this publication and to our dedicated team of editors. Dear Friends and Fellow Members, This is a fine opportunity to express my thanks for the great honor to serve as your new Club President. 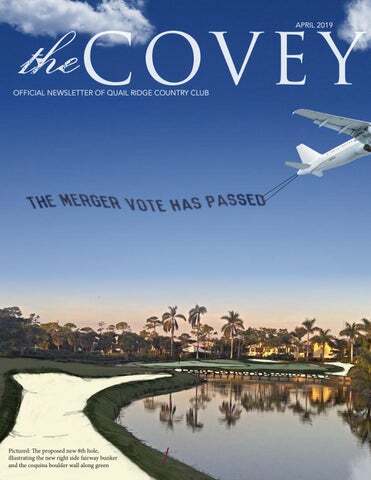 These are exciting times at Quail Ridge as we are on the cusp of the decision to merge with the POA. Though our season may be slowing down, construction is moving forward on two major projects. Let us all remember the great results of our beautiful Clubhouse as we waited for its completion. As you all know, the Merger results were announced this past Monday, April 8th at 10:00am in the main Dining room of the Clubhouse. The results surpassed our expectations with more than a 98% YES vote of those returning their proxies are being present in person. Our management team will have a summer full of work to merge the two entities into one, prepare a joint budget for consideration and have all of the documentation in place for an October 1st 2019 effective date. The South Course is officially closed and your Club Officers want to thank the staff for producing the â&#x20AC;&#x153;Renovation Revengeâ&#x20AC;? tournament and dinner as our last event. My wife and I joined 120 other members for a very memorable, creative and challenging, fun-filled afternoon of camaraderie. As usual, Carl, Chef Reza, and their team pulled out all the stops in food and beverage to add to the memories of the day. The contractor has officially begun the work and we urge you to stay off of the golf course at all times. We're proud to announce our newest app! You read that right! We've got a new app and we're happy to share that it's now available for download on your mobile phone. This app will soon replace the Clubessential App you may have previously downloaded and is designed to offer many more time saving conveniences, while helping our staff to personalize your experience with name recognition technology. This new app will allow you to: • Quick and easy access to the member directory. • Request your car from valet or even your clubs from the bag drop. • Quickly book tee times, request dining reservations, request events, and order lunch or dinner. • Easily view dining venue information including dress code, menus and activities held within the club. Upon your first visit in the App, please enable location services and allow push notifications to get the full experience. This will allow you to receive special notices in a timely manner. HOW TO DOWNLOAD THE APP It is imperative that you have your login information for the Apple iTunes or Google Play Store. From there you will be able to search and download from the App Store "Quail Ridge" We will be offering a series of training workshops scheduled to assist with your first time use of the App and to answer any additional questions. fish around, from sea to table, as well as a great wine list to enhance any dining occasion, we work hard to ensure every experience is a great experience. This season was a memorable season for many reasons! It would not have been possible without all of the seasonal staff hired to help enhance the Quail Ridge experience in addition to all the wonderful members. The season wouldn’t be as great without the staff, and for that I truly thank them for their hard work and dedication. The members embraced them as much as they embraced the members. This season proved to be of great excitement. The members took full advantage of all the activities offered to them from bingo, trivia, speaker series, lectures, a bus trip, concert series, wine dinners, a scotch night, and bubbles and paint. These are just a few of the many events and activities provided to the membership this season. At any given day or night the functions held were only an added feature to the camaraderie within the Clubhouse while many still enjoyed their dining experience at The Quail’s Nest. I have to say I’m very pleased with the progress made from food to service this year compared to seasons in the past. With that being said, I also want to THANK YOU for all your patience with us over the season. We are committed as a team to make every event, every meal, and every encounter better than the last. I wish you a very relaxing and enjoyable summer and we look forward to your return for another wonderful and exciting season to come. for a wonderful season and the opportunity to present and execute events to make your time at Quail as fun-filled and enjoyable as we can. This season we were able to bring back many events the club did not have in the past years by filling the Main Dining Room for Lectures, Bingo and Trivia Nights. We even had a chance to go on a Bus Departure to see The Temptations & the Four Tops. We were thrilled to see over 600 people attend the Great Gatsby New Yearâ&#x20AC;&#x2122;s Eve Gala where it was packed full of food, drinks, and dancing. It was an honor and privilege to be able to bring in the New Year with the Quail Ridge Family. Bingo also created an excitement for our membership with over 70 people in attendance every event. It was filled with food, drinks and the chance to win the grand prize of over $250! The excitement in the room along with the joy of spending time together was felt especially with Rochelle leading the room by calling the numbers. I can still hear her saying, "B7, B7, B-7!" In addition to those events, the members were able to continue to enjoy wine dinners, shows, painting, scotch and cigars, and plenty more. As we move forward, we donâ&#x20AC;&#x2122;t want you to miss out on the upcoming events as we have our week long Easter Celebration. Starting off with a Carnival on Thursday, Animal Showcase on Friday, Bunny Brunch on Saturday, and we finish off with the grand Easter Brunch on Sunday. We would love to see you and your family with us for all, or at least some, of these festivities. For those of you that held private events with us this season, it was a true pleasure to assist in creating and celebrating memorable experiences with you. It has been an honor to share these special moments with you and your family and friends. Working with you all solidifies my love for assisting and creating unforgettable events. Thank you and we hope to see all of you at future events! Dear Members, It’s hard to imagine spring is in the air and our celebration of the Easter holiday is just around the corner. With the Master’s Tournament set to begin, it signals another winter season at Quail Ridge will soon come to an end. will be organized using three (3) waves of tee times; 7:30-9:30, 11:30 – 1:30, and 3:30-5:30. Also, reciprocal arrangements have been made to handle any North Course overflow. Please inquire with the Golf Shop for more information. As we look ahead to the summer months we open our doors and welcome back Summer Members. During this period we continue to offer golf opportunities at all levels: Men’s & Ladies Day, Thursday Shooters, Reciprocal Golf and so much more. As the saying goes - “Time Flies When Your Having Fun!” This season has certainly flown by as we engaged in many social and competitive events, honored champions and enjoyed each For those members and seasonal staff heading others company. north, we say goodbye and wish each of you an I would like to thank the membership for their enjoyable and healthy summer. To our year-round continued support and participation of our members, the team looks forward to spending golf events. A considerable amount of time is more time together as we face the upcoming spent planning events that create unique and challenges and plans related to the South Course memorable moments. Thank you to Ronnie and Driving Range project. Grove, Golf Chairman, for his leadership and Lastly, thank you to the entire membership for vision of our program. their kindness and support of the golf operation. I I would also like to recognize the Golf and Green would like to thank all my team members for their Committee for their efforts throughout the South hard work and commitment to excellence. Our Course planning project and congratulate them goal is to deliver the best experience possible on a job well done. The golf restoration project is and we are fully committed to enhance the golfing officially underway as the South Course closed on experience. April 1.
golf news and notes On April 1st, we officially closed the South Course and turned the reigns over to Bobby Weed Design for our golf course and practice area restoration project. We respectfully request that all members and guests stay completely off the course during construction. Signs and warnings are strategically posted throughout the community. We appreciate your understanding with these matters as we navigate through this exciting, yet challenging time. Golf Pro Shop Hours Daily | 7:00 a.m. - 6:00 p.m.
Off to Augusta National On Sunday, April 7th, Nicole Gal, granddaughter of Brian & Sheila Sutherland, headed to Augusta National to compete in the Drive, Chip & Putt competition. Drive, Chip & Putt is an event that is put together between the Masters Tournament, the PGA of America, and the USGA. The event is a nationwide youth golf development program open to boys and girls, ages 7-15. Drive, Chip & Putt tested the competitors in the skills essential to playing the game of golf – accuracy in driving, chipping, and putting. The Drive, Chip and Putt National Finals aired on The Golf Channel, “Morning Drive." Gal, 15, won the Girls’ 14-15 age division by a one-point margin, finishing with 23 points total to edge out the competition. Gal collected the most points at the chipping portion, nabbing nine out of a possible 10 points, followed by eight at chipping and six at driving. This is the third Drive, Chip and Putt title for Canada in a row. Congratulations Nicole! 9 Hole Ladies’ Golf Association Is it really April already?? How time flies when we are having fun! On January 10th, we Lady Niners made our way to Delray Dunes where our friends hosted a “Golf of Mexico” themed event. It’s always great to reconnect with those gals as we consider Delray Dunes a sister club - good friends and terrific golf! First place team: Nancy Siverd, Gina Pratt-Belisle, Jackie Geswell and Dolores Gaspari. The traditional Edythe Jaeger Founder’s Cup was held on January 22nd and 29th. It is always inspirational as we pay honor to Edythe Jaeger for her many contributions to the 9-hole LGA. We congratulate Heidi Hall for winning this years event. Our Member-Member event “Retro American,” organized by Nancy Jennings and Clare Lewis, had an amazing turn-out.The tables looked beautiful and the menu was delicious. First place team: Liz Holda, Lisa Perrin, Chantana Charoenpanitkul and Ellen Mesmer. Closest to the flagstick: Heidi Hall. Delray Dunes arrived at Quail Ridge on February 12th for the “Live, Laugh, & Golf” Invitational. Nicole O’Donnell set up a beautiful table décor, and we, once again, floored our guests with the fabulous food. Chef Reza was greeted to a warm round of applause!! When dessert was served, diets were tossed out onto the putting green!! First place: Kari Floren, Eva Chaney, Maureen Mosler and Ellen Mesmer. Closest to the line: Pam Henderson (DD), and Susan Gardner (QR), closest to the flagstick: Sue Seegers (DD) and Joan McNamara (QR). Ladies Member-Member January 15-17 Congratulations to the all the teams who placed in the Member-Member Team Championship. The Overall Gross winners were Janet Kelly & Patty Sue Grove and the Overall Net winners were Lynne Lamacchia & Diane Vincent. 9-Hole Ladies - Edythe Jaeger January 22-29 The Lady Niners paid tribute to their founding member by competing in a 2-week ringer event - the Edythe Jaeger tournament. Congratulations to Heidi Hall for winning the traditional event. Pam Brosnihan Memorial Tournament January 27 We celebrated the life of Pam Brosnihan by participating in the 5th Annual Pam Brosnihan Memorial Tournament. Although golf was cancelled due to rain, over 150 members and friends got together for the dinner and evening program. The evening focused around Pam’s junior golf event and her champions that were showcased in a panel setting. Both Nicklas Staub and Chloe Koveleski stole the show as they charismatically answered questions from our golf writer friend, Craig Dolch. The PMB Foundation Board is extremely blessed and humbled by the gracious support of those who donated. Thank you again for the support and honoring Pam in this very special way. Competing in a 9-Hole Match Around format, 42 teams were seeded into flights of six teams. Each team played a 9-hole match against all the other teams in their flight. The winning teams in each flight then advanced to the coveted Shootout. Aside from the tournament competition, many other activities were arranged including various social engagements, gifts, prizes and entertainment. February 26 What a special day as Quail Ridge celebrated and supported the cancer organization, â&#x20AC;&#x153;Rally For The Cure.â&#x20AC;? In conjunction with weekly Ladies Day, both the LGA & 9-Hole LGA participated in a scramble tournament style format coupled with many fun activities and special events. The LGA raised approximately $20,000 with heartfelt donations from all, including a sizable contribution from the Royal Bank of Canada. The Lady Niners raised over $2,000. Thank you to Linda Kibler and all the Committee Chairs for their support! March 2-3 The format for this 36 hole championship event was 9 holes of Shambles, 9 holes of Alternate Shot, 9 holes of Four-Ball and 9 holes Aggregate Stroke Play (Championship Flight Only). Teams were flighted according to total team handicap index. After the final round, a dinner and awards presentation was held to celebrate all winners. March 13-16 Congratulations to Chris Smack for capturing the 9-Hole Ladies Club Championship. Chris Smack defeated Bardelle Offutt on the last hole to capture her second title over a three year span. February 20-23 Definitely a highlight event of the season, The Invitational featured a fabulous assortment of activities which was enjoyed by everyone who participated. Ronnie Grove, Golf & Tournament Chairman, arranged a spectacular event that will be remembered by all. passing shots STAY IN THE KNOW! Tennis Pro Shop Hours Monday-Friday 7:30 a.m. - 3:30 p.m. Saturday 7:30 a.m. - 1:00 p.m. Sunday 7:30 a.m. - 3:30 p.m.
Tennis Courts Hours Monday-Sunday 8:00 a.m. - 10:00 p.m.
then sign up for one of our fast paced Cardio Tennis Workouts ! Try it out...it’s a blast! Cardio Classes are on Friday, Saturday and Sunday. Please contact the Tennis Pro Shop (Ext. 3329) for reservations and times. In May we will continue our Men’s Day Doubles on Tuesday, Thursday & Saturdays (All levels Welcome), the Ladies Club Doubles on Mondays & our Mixed Doubles Round Robin on Sundays. Contact the Tennis Pro Shop for more details. If you are remaining in South Florida during the off season, our Monday & Fridays Free Guest Days will begin on May 4th. Invite your friends & guests to play tennis and then possibly enjoy some lunch at our beautiful clubhouse. Guests are always welcome at Quail Ridge! For our members who will be heading north this month we wish you a fond farewell & safe travels home. Have a nice summer and play lots of tennis. We will see you on the courts again in the fall! Big win ahead of pickleball team launch First, a big thank you to Jim Good and the gracious folks at the Country Club of Florida for inviting us to play a round robin pickleball match at their courts. Six members of our pickleball group enjoyed the competitive play, along with the cold drinks, a professional scoreboard, and neighborly spirit. The Quail Ridge pickleball team has already played it's first match against another club and we're pleased to say that the final tally was Quail Ridge 6 - Country Club of Florida 3. Taking bows are, Gail Okoniewski, France Brault, Pierre Colas, Mo Poitras, Jeff Buckley, and Don Mullaney. Tennis Excellence Awards “Night of Champions"
April 6 Congratulations to all of our award winners, tournament winners, tennis committee members, QR staff, and all of our supporters for another wonderful tennis season at Quail Ridge! Quail Ridge Tennis remains the Tennis Nest of South Florida! Peter Jones - The 2019 George Sparling Center Court Award Winner with past winners Pam Carey, Gerry Leider, George Kellner, Judy Leider, Denise Porter and Joe D’Amelio. Henri Gagnon - The 2019 Fred Fleming Sportsmanship Award Winner wth past winners Wendy Jones, Joe D’Amelio and Jan Langley. Peg Barrett - The 2019 Betty Heard "Joy of Tennis" Award Winner with past winners Denise Porter, Francie Rourke, Tina O’Connor and John LaMacchia. it must be updated to maintain its stature and playability." opportunities to level the playing field against the big strikers. The course has certainly entertained and challenged generations of Quail Ridge members and guests alike. including Medalist and Michael Jordanâ&#x20AC;&#x2122;s new golf course being constructed in Hobe Sound, Florida. He is certain to introduce a modern day design that Joe Lee would likely be proud of judging on how the game and technology has evolved. The overall condition and sustainability of any course is often a direct reflection of the quality of its infrastructure. In the case of the South Course, we are taking every step to ensure delivery of a course that is designed for the long-term. The South Course project began April 1st and we anticipate it to be completed in the late fall barring any potential weather related delays during the summer months. As most of you are aware, this is a full scale irrigation and course renovation. Relevant infrastructure items including drainage, irrigation, grasses, greens construction, bunker construction, cart paths and bulkheads will be addressed. An exciting grand re-opening is in the works for the fall. We can hardly wait! We will be sharing periodic updates with you as the course progresses through its design phases. Stay tuned for exciting updates to come. General Maintenance A team you can count on to get the job done! other than forcing our yogis to ignore outside noises and channel their inner peace, we have had very little disruption to our daily activities. This "peace" we have come to find will be short-lived and will be disrupted soon as the roof will be removed and trusses will be added, connecting the new area with the old. We will be finding Group classes and Pilates a temporary home-locations will be posted. As we plan each room of the expansion, Quail Ridge is committed to excellence. Dear Friends, 2019’s Season will be in the history book soon. Time keeps flying and before you know it, you’ll be playing on your newly renovated South Course. This Season was very eventful and there are a lot of changes and improvements on the way. Some of the items to keep an eye out for include: • The vote to merge the POA & Club is scheduled on April 8th. • New Cable & Internet Services rolling out in September. More information will be distributed regarding deployment events and other ways to obtain the new services. • Automated garbage collection for Village and Villa owners. Wheeled cans will be delivered in September with automated services starting in October. As you pack up for the summer, here are a few things to think about before departing: It is important to arrange for regular inspections of your unit to make sure that your home is secure and protected from leaks, humidity (mold), and other hazards that may arise. Quail Ridge can assist you with arrangements for this type of service, call Housekeeping at extension 3352. If you have someone other than Quail Ridge watching your unit, please notify Community Safety with this information. If you do not have a service, which we do not recommend, here is a checklist of items to take care of: - Make sure all electrical appliances are disconnected. - Unplug TV’s, and computers. Keep Comcast boxes connected and plugged in, so program updates can be downloaded to the boxes. - Turn off the main water valves, valves to the water heater, under the sinks and toilets. - Make sure your bike is stored and tagged in your bike barn or your unit. BULK CABLE & INTERNET SERVICES UPDATE Quail Ridge Property Owners Association has entered into a new 10 year contract for bulk cable and internet services with Comcast/Xfinity. The cost of the new services are included in your P.O.A. assessment. Quail Ridge arranged for a two-stage deployment; new services & equipment delivered starting September 1, 2019 and installation of fiber optic cable to begin in April 2020. Here is some information about what to expect, when the new services take effect and the services being offered. Another item that is not included in the bulk agreement, but is discounted for members is a telephone landline. The cost for a telephone line is $25/month for the duration of the contract and includes unlimited calls to the USA and numerous countries, including Canada. 3. Attend a scheduled deployment event to be held onsite (Business Center or Clubhouse) after September 1st and make an appointment for Comcast to install the equipment. There will be several events scheduled and they will be scheduled by Area. Please be advised, if you opt to take equipment at an event to install yourself, you will be waiving the “free one-time professional installation and Home Integrity check (see option 2 above). As the season comes to an end, please continue to be assured that you’re Community Safety Team pertains to pets: will be here around the clock keeping your homes 1. Pets must be kept quiet when inside your home. and the Community Safe and Secure. For those of you who will be here for the summer, as always, 2. They must be leashed and attended to at all don’t hesitate to call us if you have any questions times when outside of your home. or if we can be of any assistance. 3. Droppings must be picked up and disposed of by the owner. 4. Pets are not permitted in or around the swimming pools. They must be kept away from the golf course, clubhouse, fitness center and tennis complex. • Please notify the Community Safety Department of your approximate departure and return dates by contacting Laura Kenney at 737-5100 ext. 3373. The more information you provide, the better we can respond to any situation that may involve your home. 5. Most important, No owner’s pets shall cause any nuisance to other unit owners. • Members that maintain alarm systems in their homes should NOT have their telephone lines disconnected. If you disconnect your telephones and an emergency at your home arises, Community We need your assistance in keeping everyone Safety as well as the Central Dispatch Center safe by remembering the following: would fail to receive the alarm signal, since all alarms are transmitted over the telephone lines. • The speed limit on Quail Ridge roads is 25 MPH. • There will be many auto transports and moving • Please obey all stop signs and other traffic vans arriving in the weeks to come. Please signals. remember to instruct the drivers that they must • Don’t overcrowd golf carts. Only load your golf enter the community via the North Gate on carts with the number of passengers that it was Boynton Beach Blvd. Inform either gatehouse of their impending arrival dates. It is also imperative designed for. One person per seat! Children under the age of 16 are not permitted to that when hiring a moving van to pickup furniture or boxes, please consider the area in which you operate golf carts. reside. Some of the larger trucks and trailers • Garage doors are to be kept closed at all times, are unable to drive into the subdivisions without except to permit ingress and egress. causing considerable property damage. Quail Ridge Community Rules and Regulations While we generally enforce the community’s rule state that automobile covers are only to be used that limits commercial traffic between the hours from May 1 through October 31. 8:00 AM and 6:00 PM, Monday through Saturday, Please remember, not everyone is a pet person. Be mindful of others space and do not allow pets to approach or jump on other people. I’m pleased to tell you sales are strong again this year! 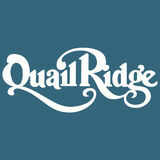 Quail Ridge has had 21 sales, 13 new members, since January 1st. Buyers see Quail Ridge as a beautiful community, an enviable lifestyle, an enticing value, and a strong investment for the future. The new clubhouse has a real “WOW” factor and makes for an exciting, resort-like experience! Potential members feel the warm hospitality extended by everyone they encounter and comment to us frequently what a welcoming atmosphere they sense in our community. April is the time when so many of you head “up north”, so I wish you well in your summer travels. Think of us often and please tell your northern friends and neighbors what a fabulous, WARM winter you just had. As always, we invite you to call us at any time to discuss our services. We are here to assist you in making a smooth transition, whether moving in, out, or just across the street in Quail Ridge. The Quail Ridge Bridge Club enjoyed a very busy season with record numbers of players participating in sanctioned bridge events, averaging about 16 tables at each week’s games. Milestones are achieved by ACBL members as they work to earn valuable points towards “Life Master” status. Some notable recent achievements are: Judy Haverkamp-- Silver Life Master, (accruing 1000 MP’s), Chuck Holderness--Club Master, Rich Dunn—Sectional Master, Linda Russell--Regional Master, and Douglas Carlson--NABC (National Association Bridge Championship) Master. Plans are being made to have lessons for beginner and intermediate Members next season. Stay tuned for more information. “Sunshine Bridge News” is a quarterly magazine that is sent to all ACBL members in District 9. District 9 is one of 25 districts created by the ACBL, and is responsible for maintaining standards (which are set by the ACBL) and running regional bridge tournaments. Their website is: www.district9acbl.org. TOP TEN GOODWILL GESTURES IN BRIDGE (from “Sunshine Bridge News”) 1. Greet and welcome opponents. 2. Always say, “Director, Please.” 3. Lead or place dummy before you write. 4. Mentor a new player. 5. Say, “Thank you, Partner.” 6. Compliment opponent’s play. 7. Discuss hands after the game. 8. Accept defeat and victory with grace. 9. Leave a tidy table. 10. Smile often. The QRBC would like to thank Linda Randall and Diane Haden for their time, energy, and effort in the planning of our Pizza Parties this season. Hope to see you at the Bridge Table! Charles and Susan are from Winnetka, Illinois. Charles and Susan have been coming to Quail Ridge since 1980, visiting Charles' parents, Anne and Henry Baby. Charles is retired and Susan is a Realtor. They are also members at Old Willow Bath & Tennis in Northbrook, Illinois. Jacques and Chantal join us from Quebec City, Quebec. Jacques is a retired Pharmacist and graduate of Laval University. Chantal is a retired Accounting Manager. They are also members of Royal Quebec Golf Club in Boiscatel, Quebec, Canada. R. Britton and Karen Hanley Colbert have joined us from Sewickley, PA. Britt graduated from Mercersburg Academy and Univ. of Denver and Karen from The Masters School and Garland Junior College. Britt continues his career as a Hotel Litigation Consultant. Karen is a Photographer. They are also members at The Gulfstream Bath & Tennis Club. David and Laura are legacy members of the late Joseph & Anita DuChateau. David and Laura are from Brookfield, Wisconsin where David is President of Ring & DuChateau, LLP, an engineering consulting firm and Laura in customer service for Pet Supplies Plus. David is a graduate of Marquette University while Laura is a graduate of the University of Wisconsin. Michael and Audrey are from Downers Grove, Illinois. They are both graduates of Western Michigan University. Michael is currently VP of Sales at Ware Industries, a manufacturing company. Audrey is a retired Special Education Teacher. Jean-Guy Gourdeau & Christina Roberts | Golf Members (Kittiwake) Jean-Guy and Christina are from Quebec, Canada. They discovered Quail Ridge as Stay & Play members. Jean-Guy is a graduate of McGill University and is currently President and CEO of the Montreal General Hospital Foundation. Christina is a Wellness Coach. They are also members of Royal Montreal Golf Club in Quebec. Carl and Jane are from Hampton, New Hampshire. Carl owns an insurance company. Jane is retired. They also belong to Abenaqui Country Club in Rye, New Hampshire and Atlantis Country Club in Atlantis, FL. Lindsay is from Baltimore, Maryland. She is a graduate of the University of Pennsylvania with a MS in Biology. She previously taught in a local college She is also a member of Elkridge Club in Baltimore, Maryland and St. Andrews Club in Delray. Alain and Maryse are from Quebec, Canada. Alain is a graduate of Laval University and currently is a partner at the law firm of Blake, Cassels & Graydon. He leads the Infrastructure, P3 and Project Finance practice group. Maryse was in the fashion design industry. Timothy and Mary have joined us from Minster, Ohio. They were Stay & Play guests last year. Tim is a graduate of Albion College and President of Coldwater Machine Company. Mary is a graduate of the University of Michigan and is a registered nurse at Wilson Home Care and Hospice. They also belong to two other Michigan clubs including Huntsman Hunt Club in Dryden and Huron River Club in Farmington. John and Judith are from Basking Ridge, New Jersey. Joseph is a partner at Jardine & Pagano, P.A. Judith is CEO & President of Kevco Electric, a highway construction company, which she recently sold. They are also members of Essex Country Club in West Orange, New Jersey. Jim and Cindy Rhodes join us as full-time resident members and are previously from Quogue and Manhattan, NY. The Rhodes rented here for a couple years prior to joining and before that were Non-Resident Tennis members. They have a 15 year old daughter named Madison and a 1 year old mini golden-doodle named Bailey. Jim is a retired attorney. The Rhodes are also members at Shinnecock Yacht Club in Quogue, NY. Allen and Marsha join us from Boca Raton, FL. Allen is a Managing Director at FTMC Loans. Marsha is a retired mortgage banker. They are also members at Boca Raton Resort and Club. Frank and Sally are from Paoli, Pennsylvania. Frank is a graduate of Villanova University and a Flexible Packaging Account Representative. Sally is a graduate of West Virginia University and retired. They are also members at Waynesborough Country Club in Paoli, Pennsylvania. Robert and Jo Sterling join us from Charlotte, North Carolina. Robert is a CoFounder of a private security firm and Business Segment Manager within the paper industry. Rob and Jo also belong to Quail Hollow Club and Charlotte City Club in Charlotte, North Carolina, DeBordieu Colony in Georgetown, South Carolina, and Diamond Creek in Banner Elk, North Carolina.